And do you sometimes not know how to an answer? This is what happens when I don’t plan. What’s worked for me over the years is to plan. It takes some time, but I figure what I lose in planning time, I make up for in getting to skip Wednesday night runs to the store because I didn’t have anything in mind for dinner. (I still make them. Just less often). 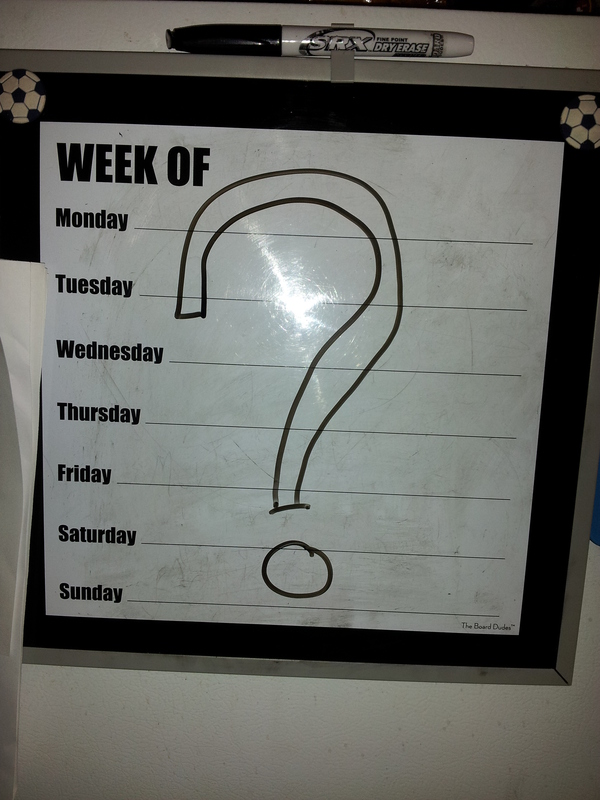 I’m not going to get into the nitty gritty planning details. Pick your recipes, check the pantry for what you have, check the sale flyers, make a list, get thee to the grocery store. Or you can start with the sale flyers and the pantry and go at it that way to keep cost down. Either way. This is more about WHERE to get the ideas. I get up on Sunday Sunday mornings, pour myself a cup of coffee, and sitt down in my dining room. 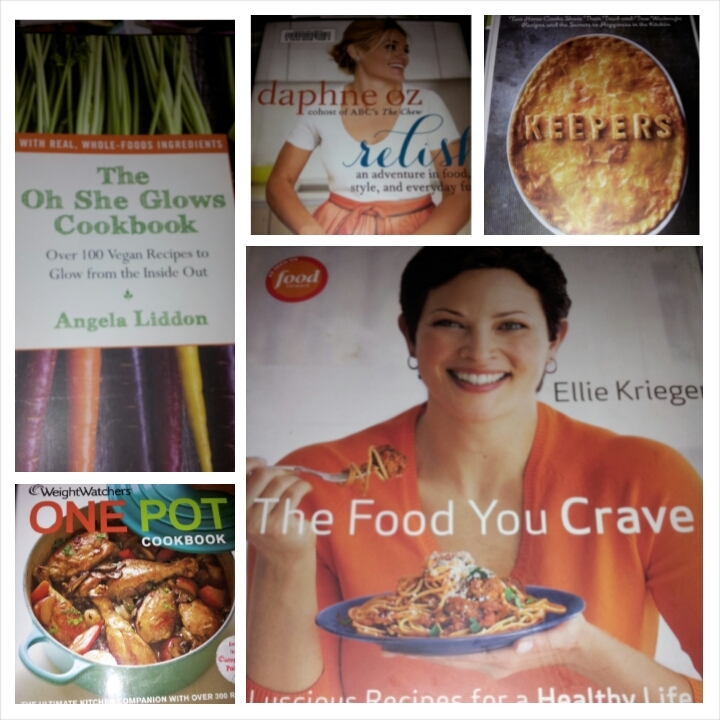 From there, I’ve got access to my cookbooks. 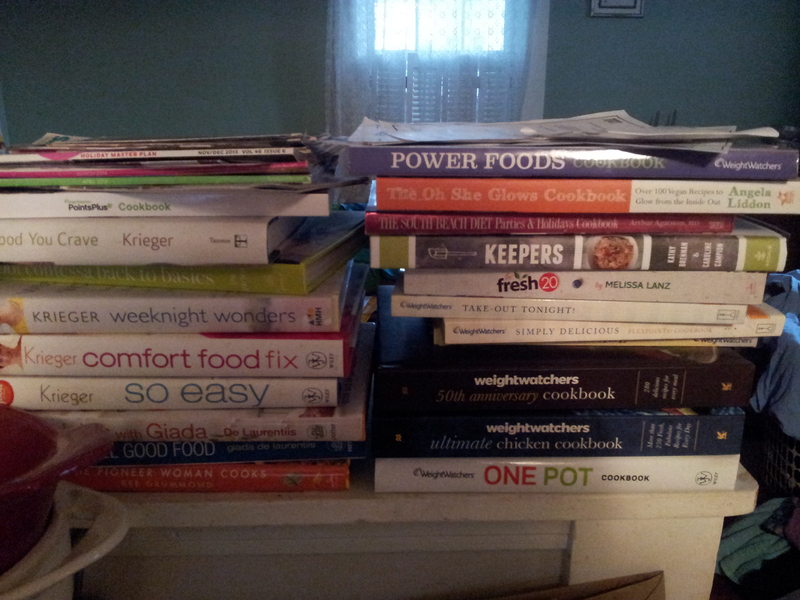 I have… a few cookbooks. 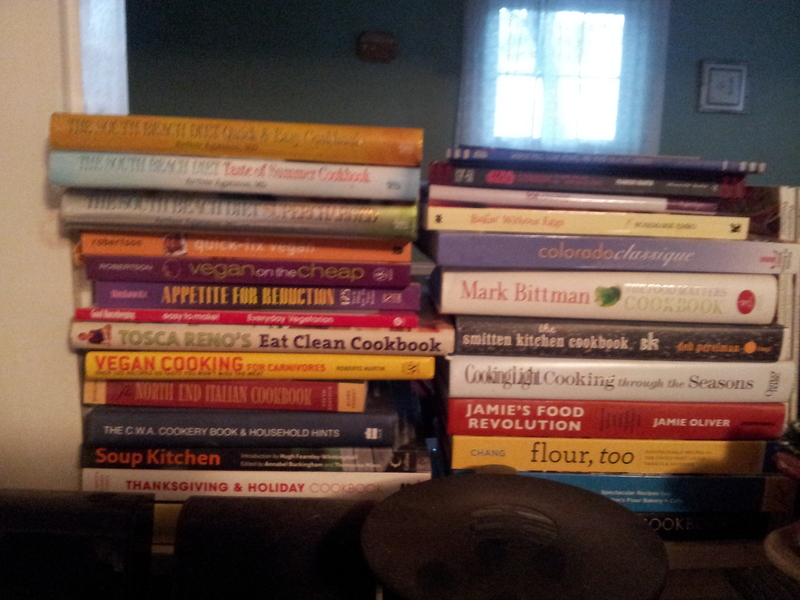 All kidding aside, I have a major cookbook obsession. Last year, between my birthday and Christmas. between gifts and gift card purchases, I think I got nine new ones. But I use them, so it’s all good. Some get used a lot more than others. Some are for special occasions. Some are just to make the stacks look even (not really). The Oh She Glows Cookbook: Oh my GOSH, I love this book. If you don’t know Oh She Glows, it is a website for vegan recipes. While I’m not a vegan, everything Angela makes looks amazing, and everything I’ve tried IS amazing. Keepers: This is a newer book for me, and hasn’t gotten a lot of use yet, but the “Jump-In-the-Mouth’ Turkey Cutlets are really, really good. Relish: I don’t watch The Chew, and I didn’t even make the connection that Daphne Oz was the daughter of Dr. Oz, but this book was reccommended to me and it’s fab. Part cookbook, part party planning manual (which I ignore because HA). I took this out of the library first (I do this a lot, I hate cookbook buyers remorse), but I’ve already added it to my GIANT cookbook wishlist on Amazon. Weight Watchers One Pot: If you are on Weight Watchers, or if you are trying to eat healthier, or if you like FOOD, go get this. Everything I’ve made from here, from the Cinncinnatti Four Way Chili to the Chicken in White Wine (the one on the cover), has been incredible. It definitely does NOT taste like diet food. The Food You Crave: Oh, Ellie. You’re my hero. I have every one of Ellie Krieger’s cookbooks, but this was my first and it is still my favorite. Baked Shrimp with Tomatoes and Feta. Make it. Trust me. How to Feed a Family: Not pictured. Because I don’t have it yet. But it’s top on my list. Skinnytaste: You probably know the blog of the same name. I’ve been waiting for this cookbook for a while. And there is still a while to wait, because it doesn’t come out until the fall, but if you’re a cookbook dork like I am, you can preorder it! And even with all those cookbooks, I often turn to the internet. I will usually have something in mind and just start with Google, but these are the sites I wind up on most of the time. Emily Bites: This site is newer to me but the tagline of ‘Lightened Up Comfort Food’ means it’s already a favorite. Make the Deep Dish Sloppy Joe Casserole. Trust. Skinnytaste: There it is again. It was worth repeating. Recipes are healthy and have Weight Watchers point listed. This is NOT your mama’s Salisbury Steak with Mushroom Gravy. Unless your mom made that really well and healthy. LaaLoosh: Weight Watchers Points included. Asparagus Goat Cheese Risotto. YUM. And that is how I get here. 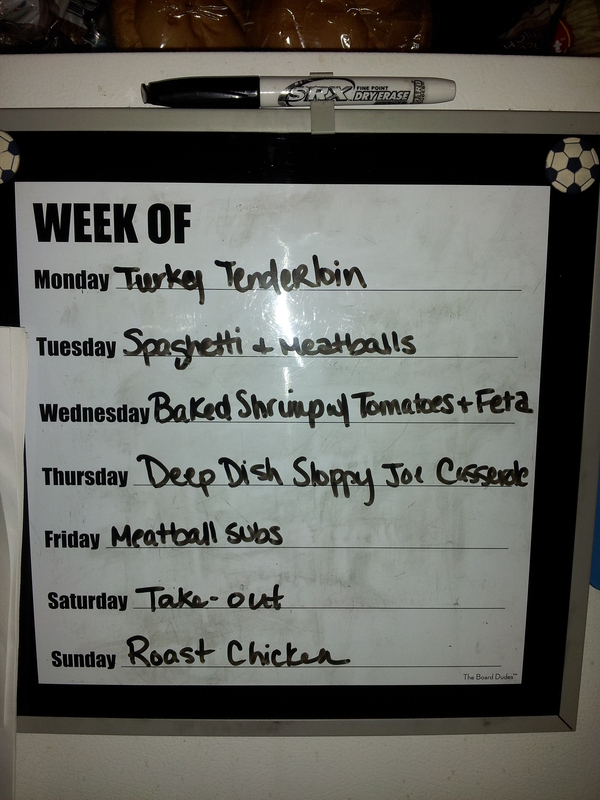 How do you meal plan? Favorite cookbooks? Website suggestions?